Texas stereotypes? Check, check, and re-check. Overwrought, heavy-handed, formulaic, and pandering? Checkity-check-check-check. Did I sob like a baby for 1 full hour and wish I'd remembered my blankie? That'd be a hard check, playa. 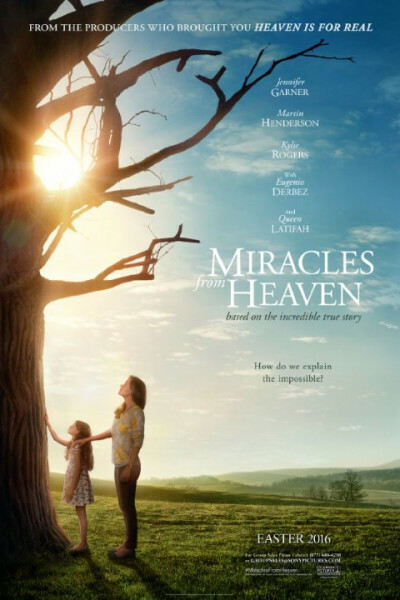 Miracles from Heaven is big Texas hair, overdone eye shadow, everyone-owns-a-horse, outdoor BBQs, pretty sunsets, mountains of cheese, and Footloosey pew scenes and church music. And yes, Jennifer Garner's seething anger and bitter hopelessness grows mighty wearisome, despite being the very point about breaking points. But by the end it doesn't matter, you won't care about that, and all is forgiven. The miracle here, to my way of thinking, is that—despite all these barnacles, lichens, leeches and distractions—the film, and Anna Beam (portrayed by a radiant Kylie Rogers) will steal your heart anyway, despite your protestations, ripping it beating from your chest like close-up surgeony magic performed by doctors Criss Angel and David Blaine. You can't stop it, try as you might. You'll think, "Gosh, this is so silly" while wiping your face with your sleeve and begging your seatmate for another Kleenex as your chin trembles like a bobblehead-inspired PEZ dispenser. I hated it, and I loved it. And that, my friends, is close-up, miraculous magic. p.s. A big shout-out to Brighton Sharbino ("Abbie Beam"), our neighbor from down the street way back when. She does great work here, and you'll recall her sister, Saxon, also did a fine job in 2015's reincarnation of Poltergeist. That family is killin' it! Show some love, would ya, and go see their work in theaters; it's smooth and pitch-perfect, and only the beginning of things to come.